Saigon is a tourist attraction and one of Asia’s fastest changing cities. Not just with its colorful look and bustling ambience, Saigon gains fabulous fame from its stories throughout periods of time. These years, Saigon is considered a city of opportunity and development, with an influx of international and domestic entrepreneurs starting their businesses in this city. You can easily see Saigonese sitting by themselves with their Mac books or working with a team energetically at the vibrant cafeterias or open-space areas. These young passionate people could be known as ”hipsters”, hipsters in their own businesses. Young Vietnamese entrepreneurs do not want to follow ordinary career paths, they create their own ideas, work hard on their own projects, find other distinctive ways to make a living. They are young, free, and talented. 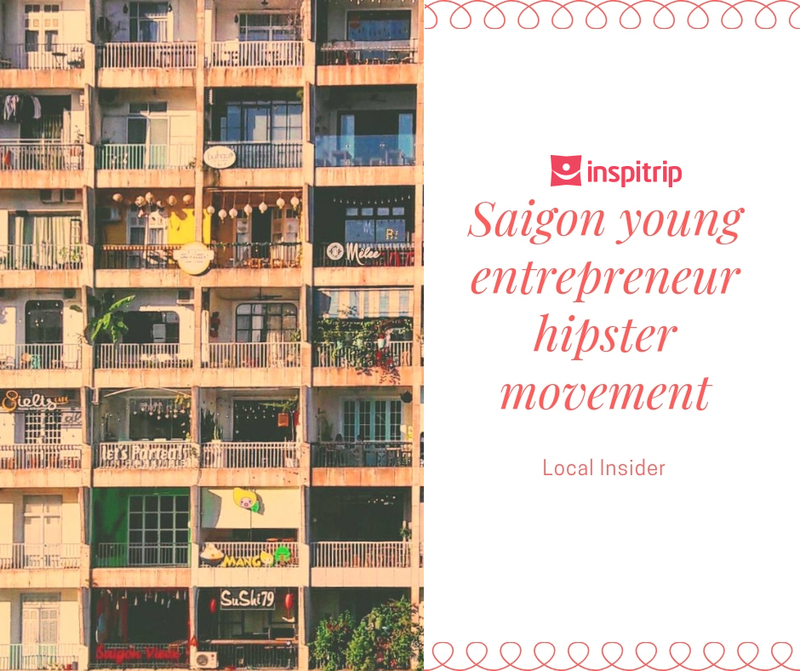 With the Saigon young entrepreneur hipster movement, Saigon has begun to transform from a historical and cultural icon to an economic one. Young Vietnamese entrepreneurs are founders of many profitable projects, including these movements and spots listed below! Now, walk down alleyways to live among the intriguing Saigon young entrepreneur hipster movement fully! Built in the 1960s, the building at 42 Nguyen Hue that stands on the side of Nguyen Hue walking street attracts hundreds of visitors and Saigon citizens everyday. 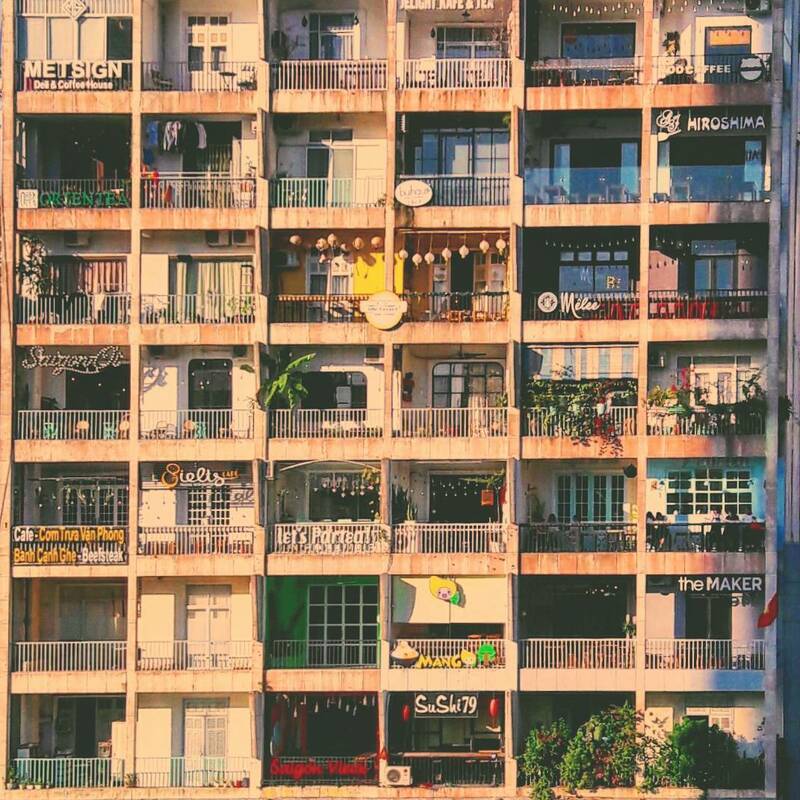 Though the building is occupied by Fahasa bookstore on the base and second floor, you could easily recognize the 42 Nguyen Hue building by its 60-year-old apartment block with nine storeys and its color-block-style at day or shimmering lights at night. 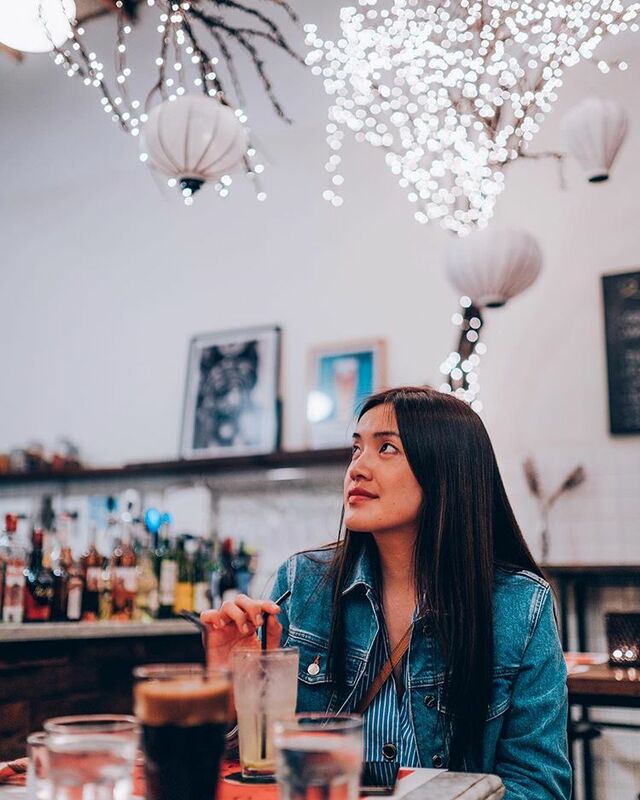 42 Nguyen Hue is known as a part of the Saigon young entrepreneur hipster movement and a very familiar place for any Saigon wanderers and fashionistas. You could choose an elevator (fee: 3000 VND) or climb up the stairs to explore every corner of this building. Though it is quite dark and a bit dingy inside, the best feeling while stair walking is looking up through the open space to see the sky, the rest of city and the other upper floors of this apartment and feel the breeze. That is really amazing! An unforgettable sight. The apartment is known as the home of Truong Buu Khanh, a government official, interpreter of President Ngo Dinh Diem before 1975. His family lived there for two years from 1961 to 1963. His son, Marcelino Truong captured their stories in graphic memoir novel “Such a lovely little war”, and then created a feature film of it. The building was given to workers from the Ba Son Shipyard in District 1 after 1975. It was kept as a lower-middle class building until Nguyen Hue walking street was built in 2015. Now, the real estate price of this building is really high. Current business owners at 42 Nguyen Hue still want to keep retro decorations from the past and they design their stores in a very vintage style. Most of stores here focus on cafeterias and clothing. You could easily find stores the likes of: The Maker Showroom, Chic Bae 21, Buom, Lapin, Shimmer Silver, Begi, The Eye, Cosette, The Bra Shop, Lou, NauNau DIY Studio, Cheddar, V Station, Cati Madeline Boutique (fashions stuffs like clothes, shoes, accessories, lingerie, bags and cosmetics), Kawaii Nail (nails), Poke Saigon, Saigon Vieux, Sushi 79, Thinker & Dreamer, The Maker Café, Mango Tree, 8IELTS Café, Partea, Saigon Oi, The Letter Café &Clothes, Melee Coffee, Orientea, Buihaus, Hiroshoma, Boo Coffee (foods and drinks). An old building in the modern city. 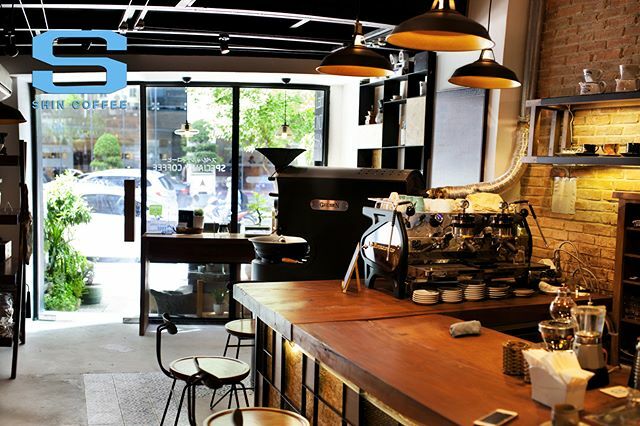 Located at 13, Nguyen Thiep, District 1, HCMC, Shin coffee was founded by a passionate businessman named Nguyen Huu Long. Through many ups and downs in his entrepreneur career path and experiences in Japan, what Nguyen Huu Long brings to his business is not only the best recipe of coffee making but also the art of how to create an unforgettable taste. In the flow of the Saigon young entrepreneur hipster movement, Shin coffee is a pioneer in the Saigonese high-quality coffee shop trend. “Shin” is the abbreviation of Mr. Long’s “sensei” in Japanese, he keeps the name as a sign of respect to the iconic Japanese spirit. Since inspired by Japanese culture and lifestyle, Shin coffee offers you the best hospitality, quality of coffee and the most professional staff when you take a sip of coffee in here. There are more than 30 kinds of coffee beans from all over the world. You could choose your favorite one, or try Vietnamese “ca phe sua da” or “ca phe da”, you will not forget it later! When stepping into a coffee shop, you also will be amazed by Shin coffee’s decoration, Mr. Long has brought a lot of Japanese artisan products like teapots, artworks…making this place more intriguing and unique. There are interesting areas in this coffee shop where you can seat yourself down for relaxation or working. There’s seats near the barista counter if you’re interesting in watching the process of making these high-quality drinks, at the back of the shop if you want to get work done, and even on the second floor if you’re interested in people watching from a higher vantage point. Currently, customers of Shin coffee are mostly expats and travelers, while less than 1% of them are Saigon citizens. 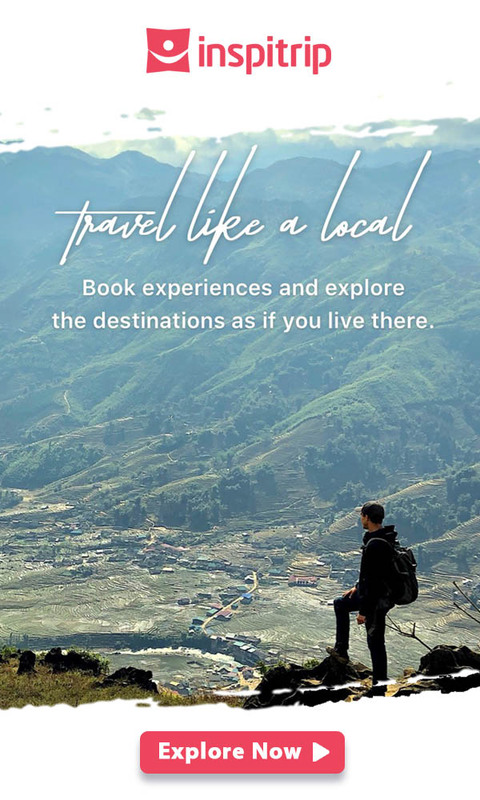 Mr. Long chooses the center location being surrounded by hotels to make it easier for any visitors to reach and try the best Vietnamese coffee. Now, do not hesitate to take this pricey, but classy coffee! I am sure you will be happy and content after drinking it. A cup of coffee egg is what expats and Saigoneses are always looking for in Shin coffee, because it is hard to have a good one in Southern Vietnam. Try it! A tranquil corner at the barista counter of Shin café in the early morning. L’uisine is emerging in the Saigon young entrepreneur hipster movement with an aim to bring a different cultural perspective of rich historical and cultural Saigon to the world, throughout their art exhibitions and artisan products. Visiting L’usine is definitely a wonderful thing to do in Saigon. With three stores at very distinctive locations, each one of them is a vintage cafeteria retail concept store in a dark alley of old Saigon old building or a street-front coffee shop with its own unique aesthetics style. L’uisine always intrigues like-minded people, travelers, expats interested in Vietnam cultures. Visit L’uisine, enjoy European classic meals in a classic colonial decorated building with dishes like pastas, lasagnas or sandwiches. Then take a sip of wine, smoothies, or your favorite drink. Saigon is developing gradually day by day and has become a frontier market in recent years. People who visit Saigon and return to it after a few years are always surprised by its changes and renovations. It is the time for you to take your backpacks and immerse yourself in the Saigon young entrepreneur hipster movement. Saigon, a city of youth and nostalgia, definitely brings new breezes and remarkable experiences to you even at very first glance.